Primrose Farm is a place to see chickens and cows, sure, but it’s also a place to photograph gorgeous sunsets, do yoga stretches at sunrise, meet old friends for an afternoon hike and make new memories with moonlight hayrides. With its classic red barn, towering silo, quaint summer kitchen and fenced paddocks, Primrose Farm is a visual artist’s delight. Inspiration for photographs and paintings are as abundant as the eggs from its hens. And its bucolic charm makes it an ideal place for lively conversation or quiet reflection. The celebration of Primrose Farm’s artistic side is reflected in its new logo. 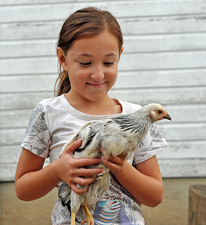 “Farm life can mean many things to many people,” says Alison Jones, St. Charles Park District. New programs and events will showcase the world beyond the farm. “Primrose Palette” will take place each Saturday from June 3 to 24 from 7 to 9 PM. Inspired by the popular paint-with-a-pal stores cropping up around the area, the “Primrose Palette” classes are a great gathering place for an artistic party with friends and family -- and provide a nurturing environment for a budding artist to try out her skills in an unconventional class setting. These painting classes with a twist are conducted by an experienced artist who will lead participants with a step-by-step tutorial to create a frame-worthy masterpiece. All art supplies are provided. With the scenic Primrose Farm location as its inspiration, there’s no end of suitable subject matter. Maybe it will be a sunset over the surrounding fields, a still life of produce from the kitchen garden, or a portrait of one of Primrose Farm’s resident – and photogenic – livestock. Artists can create their original work of art while enjoying a variety of delicious snacks and non-alcoholic beverages. Participants age 21 and over are welcome to bring their own wine. The fee per class is $25 for residents, $30 for non-residents, and advance registrations is required. For more information on the “Primrose Palette” series of classes, contact Alison Jones at 630-513-4374.